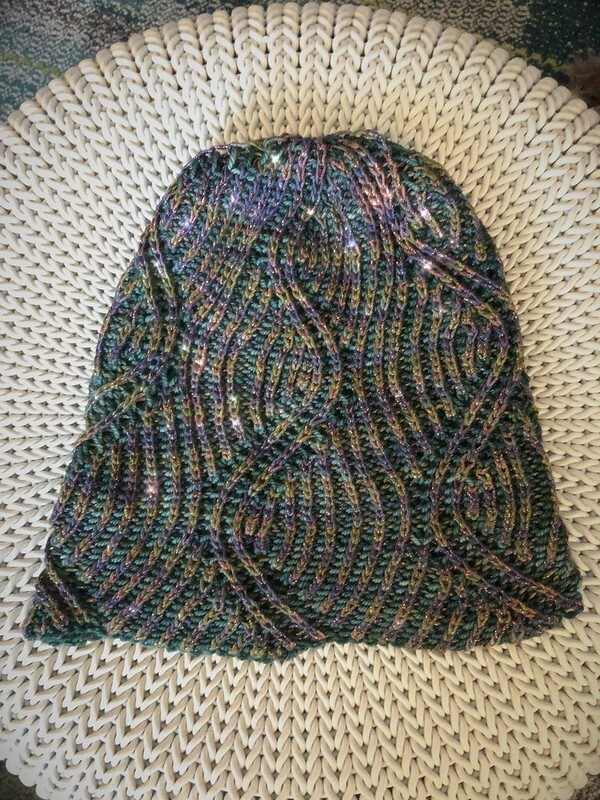 I knit another brioche hat this month with the original intentions of giving it to my girlfriend Alisa. I mentioned she wanted a hat with purple in it but she told me she wanted simple. I quickly realized I was not making a simple hat and that it would be better suited for me than for her. 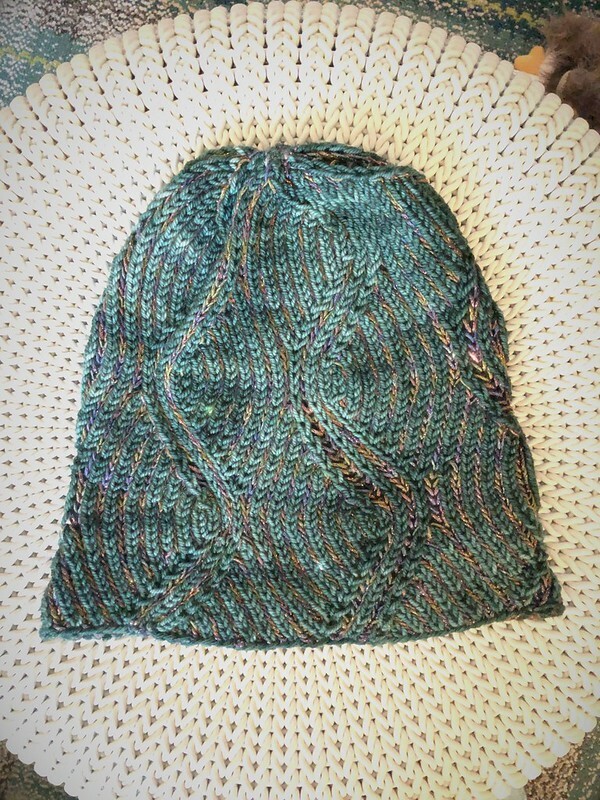 So the Beezee hat became my latest brioche wonder and I’m happy I kept it. Teal side is dominant here. One of the things I love about brioche knitting is that it creates a reversible fabric so I love picking great contrasting colors. 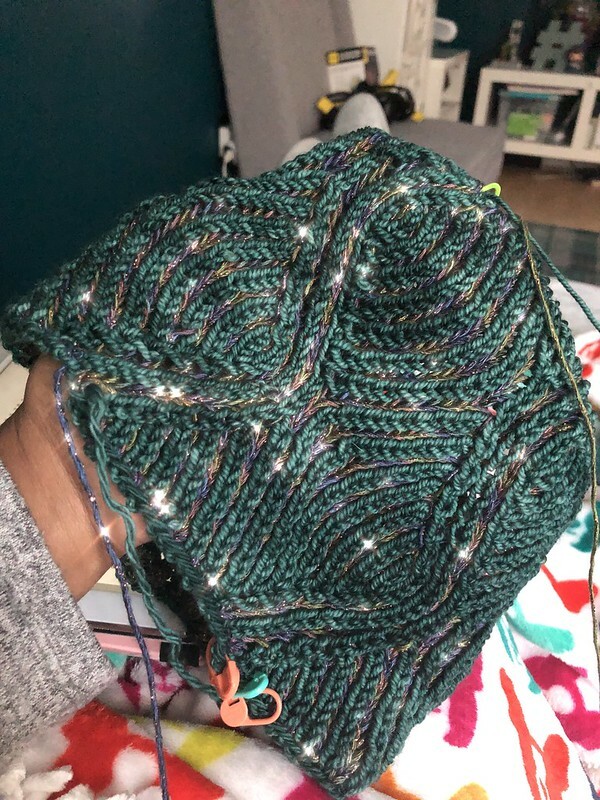 For this hat I decided to use the leftovers of my Blue Heron Rayon Metallic yarn from my first Rain Outside shawl and a very old skein of Neighborhood Fiber Co. Studio Sport in Rock Creek Park, a lovely deep teal. I love how the metallic pops through when you wear it with the teal color as the dominant color on the hat. If I’m feeling a bit fancier I can wear the metallic side out. Metallic side is dominant here. I picked this pattern because I loved the wave pattern the brioche created. But she has several really great brioche patterns in her shop that you should check out. I love the shape of this hat and totally want to make that one too. I also love that it let’s me use of some of those half skeins of dk weight yarn or leftovers from my jumbo Miss Babs Yowza skeins and turn them into color finished objects. And I’ve got another road trip coming up soon so I just might be knitting up another hat in the car. So have I convinced any of you to pick up your two colors and hop on the brioche band wagon? Firstly, I love the fact that one of the yarns is named Rock Creek Park because I know and love Rock Creek, and I love teal. Secondly, you are tempting me to try it RIGHT NOW; however, as mentioned before, I’m in two KALs for February (say what?!) and am working on a third project for my ladyfriend. But soon! Really. Are you considering DreaReneeKnits’ Rose Gold shawl yet? I have that pattern. Rose Gold has been suggested to me a couple of times but I’m not a huge shawl person. BUT since it’s a brioche shawl I’m a bit more tempted. I did swoon over Coffee at the Grand https://www.ravelry.com/patterns/library/coffee-at-the-grand It’s very old school and lovely even though I know I’d never make the tassels on it. Maybe if I have enough in my stash for either I might give on a go…that could be really good car knitting. I get the best leads for knitwear designers from you and your other friends, Dana! Got myself so excited about all the things I want to knit that I ground to a complete standstill this week… spent more time looking at patterns than knitting! I’ve got a straightforward need for a new walking-in-the-park pullover to tend to, but the thought of trying out brioche sounds ever more enticing. What a beautiful hat! Just tried out the Craftsy class on brioche, because I’ve been meaning to try it for forever. I’m working on a basic, single color brioche hat, and I think I finally got the hang of it. Such an addictive stitch! It’s taken me 3 tries, though. Have you found a good description of fixing mistakes? Would love to tackle something like this next in 2 color. So I learned from an in person class how to fix my mistakes so I haven’t watched any videos on it. It’s all about reading the stitches and it still takes me a minute at times but definitely worth knowing how to do. I’m sure YouTube will probably have a billion examples. Beautiful hat! I do love the feel of brioche, but I don’t always have the patience to knit the more complicated patterns. You have gorgeous knitting! Yay, score for you! I never knew brioche fabric was reversible and had always wondered b/c I know some talk about how they liked the other side more b/c of the colors. Yeah I tend to like the side where a variegated color is more dominant but I love that it’s reversible.